If you want your toddler to sleep in her own bed and she’s having trouble getting through the night alone, acknowledge her anxiety. 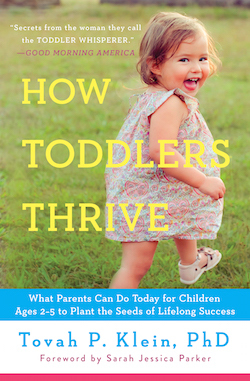 “Toddlers are at the height of learning to separate from mommy and daddy, and sleeping alone, for many, is a place where they feel they [just] can’t separate,” Klein says. At bedtime, give your child something that reminds her of her parents, like a stuffed animal, a family photo, or mommy or daddy’s shirt, and remind her that you’ll see her in the morning when everyone reunites after a night apart. If your toddler is hitting his siblings, overeating or constantly throwing tantrums, he could be exhibiting early symptoms of behavioral problems—or he could be completely normal. Distinguishing between regular childhood misbehavior and acts that could be cause for greater concern is best left to the experts, but parents can help by avoiding any alarmism and keeping a close eye on their children for any unusual or excessive acting out, says Tovah Klein, director of the Barnard College Center for Toddler Development.